Sign up for a free four-hour block to get started with 3D printing, with hands-on help from Computer Vet techs on the second floor of Odegaard. 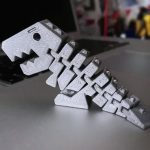 Try out the Print of the Month, a flexible 3D dinosaur called Flexi Rex. Or bring a file from MakerBot’s Thingaverse, an online community for people interested in making and sharing 3D printable objects. The experience can prepare you to use other 3D printers, such as in Area 01’s Dabble Lab, CoMotion’s MakerSpace, UW Bothell’s Makerspace, the Collaboratory, or at the UW Tacoma Learning and Research Commons.